The house gecko (Hemidactylus sp) is a common sighting around Marsh Harbour, Abaco, Bahamas. 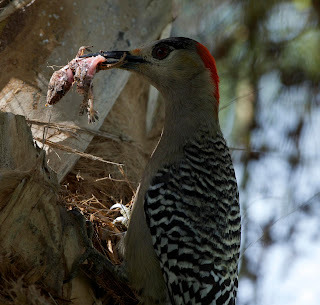 As shown in the photo, it has become part of the diet of the West Indian Woodpecker (Melanerpes superciliaris). A substantial source of protein for the hatchlings waiting inside the nest, and potentially a change in foraging behavior in the woodpecker. I observed the woodpecker searching for geckos in the palm fronds and tossing them to the ground, immediately flying down to capture the geckos.